The ESP8266 is a brand new low-cost WiFi chip from Espressif which allows you to easily connect your project to the Internet of Things with a simple UART AT command interface. Additionally the ESP8266 can be used as standalone microcontroller with WiFi, programmed directly through the Arduino IDE. Its powerful 32-bit processor with large flash allows you to run pretty complex and demanding sketches. This is the ESP8266 ESP-14 module with PCB antenna and communicates at 115200 baud. The module breaks out all necessary pins of the chip to a 2x8 + 1x6 SMD header with 2mm pitch. No external circuits are needed. 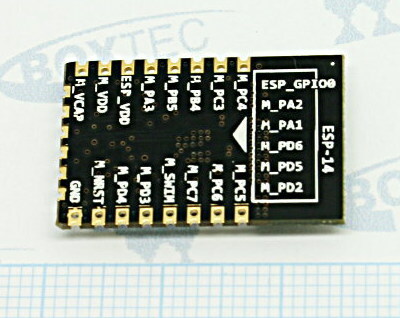 The ESP-14 module only connect RX/TX from the ESP8266 to the outside, the rest of the GPIO pins run through a STM8S003 8-bit microcontroller. Note: Your power supply needs to be able to source at least 300mA @3.3V during startup of the module.